Average Height	: 10" - 13"
Average Weight	: 13 - 30 lbs. A relatively new breed, the Cesky Terrier was developed from crosses among the Sealyham, Scottish Terrier and possibly the Dandie Dinmont. The Cesky (ches-kee) Terrier (sometimes called the Czech or Bohemian Terrier) originates from the Czech Republic, and was developed through a cross of the Sealyham and Scottish Terrier. Initially, the breed was developed as an all around hunting Terrier, good at tracking as well as going to ground. Today's Ceskys are wonderful companions who also compete in agility and some den trials. The Cesky is relatively new to Canada and only gained Canadian Kennel Club recognition in 2000. The American Kennel Club presently recognizes the breed under its Foundation Stock Service (FSS). The Cesky's temperament is somewhat different than most other Terrier breeds: He is very adaptable, loves people especially children, and gets along well with other pets. He is dedicated and loyal to his family, intelligent, and always eager to please. Somewhat reserved toward strangers, the Cesky is a good watchdog who is alert and will definitely let you know when someone comes to the door. He makes a pleasant and cheerful companion with a kind disposition. The Cesky's coat is soft and slightly wavy with a silky gloss. His colouring is blue-gray — ranging from silver to dark charcoal. He may be uniform in colour or have lighter markings on the face and extremities. The Cesky Terrier is generally eager to please, very responsive and sensitive. Training should always be done in a positive and consistent manner. Puppies are born black and lighten over time (up to three years). **There is also a light brown variety but this is extremely rare. •	Hypo-Allergenic, minimal Shedding. Soft, wavy Coat. •	Cheerful & Kind Personality. The Cesky Terrier is known as a happy, sweet dog that is great with children. It is also known for being not as aggressive as some of the other terrier types. They are considered courageous, obedient, loyal, patient and brave dogs. Uncommon to most other terriers, Cesky Terriers generally get alone well with other dogs. This breed of dog does well with strangers however, as a terrier they are still inherently fearless, stubborn and feisty. With strangers they tend to be more reserved and thus, frequent and early socialization with other unknown people is highly recommended. And while they love people, they seem to have a special affinity for children particularly if they are raised in a family with children. They are well mannered and want to please their owners. They love to be around the people they love the most. They crave human interaction and attention and therefore typically are kept exclusively as indoor dogs. When they are puppies, the Cesky Terriers are full of energy, but as they grow older they are more sedentary only becoming very active when they know that it is play time. Keep in mind that Cesky Terriers love eating and stealing food. Do not leave a sandwich unsupervised in the presence of your Cesky Terrier or it will soon be their next meal. The Cesky Terrier is a very healthy, hardy breed. Because of this it is not prone to any major diseases. The Cesky Terrier has a coat that will need to be trimmed and cared for on a regular basis. Only bathe the Cesky Terrier when necessary. Like all terriers the Cesky has a natural oil to the coat that helps the hair repel dirt and water. The Cesky Terrier has minimal exercise needs and they do well in the city or in an apartment. Ceskys also make ideal dogs for country live, very active and willing to spend a day out exploring or just being out in the yard or garden with their family. It is important to provide lots of exercise for the breed simply because they both enjoy food and treats plus their body has a slower metabolism, causing them to store fat. Without enough exercise it is very difficult to keep this breed within their ideal weight range as they are prone to weight gain even with small amounts of food. The Cesky Terriers' exercise needs are met easily. If you give them daily exercise with a walk or a nice game of fetch, this will be adequate exercise. This breed of dog loves to play and run through the open countryside or a wooded area. Even though the Cesky is not a large dog they do enjoy activities such as jogging, hiking and even playing a game of tag with the kids. They are very athletic and enjoy participating in most activities that families do together, and they are typically very fond of riding in vehicles, making them an ideal traveling companion. One way to help the Cesky Terrier stayfit is to involve them in a daily exercise and training routine. This can be a relatively short period of twenty to thirty minutes twice a day in which the owner and dog spend time walking or jogging but also randomly making other requests such as "sit and stay" or even "fetch". This combination of both training and exercise helps to keep the dog focused on the owner as well as adding mental stimulation for the dog. Cesky Terriers are quite responsive, sensitive and intelligent dogs making training them an easy process. However, it is important to keep in mind that they have a soft, mild mannered personality that does not do well with hard, negative training tactics. It is best to work with the puppy from a young age, focusing on building rapport and trust with the dog. This breed of dog is very often quite naturally obedient as their personality is very loving and anxious to please. These dogs need a consistent and positive training regime. Because they have a great love of food, one of the most common training needs is to rid them of this behavior. It is also often the most difficult problem to correct. Keeping food and garbage in secure areas of the house or out of the reach of curious puppies and dogs will help prevent this habit from forming. Along these lines, it is very important to begin house breaking your Cesky Terrier right away. One of the easiest methods of housetraining a terrier is to use a crate training routine. This enables the owner to take advantage of the puppies nature urge to keep their den area clean. People using crate training have to be very consistent with their timing to avoid the puppy using the crate as a toilet area. Puppies should never be punished for this accident, as it truly is a timing error on the part of the trainer. In addition the crate should not be used as a punishment or "time-out" under any conditions. 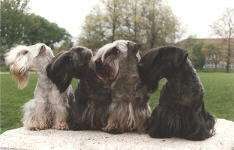 Cesky Terriers, like all dogs, will need to have a socialization component to their training from an early age. This is as simple as taking your puppy with you in the car, to the park, and on strolls around the neighborhood. The better socialized the puppy is the more it will be able to adjust to new things and people in its life without becoming timid or aggressive.